The Occupy Wall Street protest now involves thousands and similar protests are taking place in dozens of cities and towns across the country. But why here in Cincinnati? Cincinnati is a microcosm of the country. Thousands of Cincinnatians face high unemployment, live in poverty, or lack of health insurance, while a handful of multimillionaires live in luxury on the salaries paid by the national and multinational corporations headquartered here. Like the rest of America we in the 99% watch our community’s economic situation deteriorate while the 1% at the top increase their salaries, take home more stock option, and prepare their golden parachutes. Just as on the national level, the very wealthy, the CEOs of banks and corporations, dominate the Republican and Democratic parties, setting the political agenda in Cincinnati, Hamilton County, and Ohio. Here in Cincinnati, capitalism doesn’t work any better than it does at the national level. The corporations that pay such enormous salaries also exercise enormous power and influence. They hire and fire the executives, middle managers and workers, determine their salaries, benefits and conditions. The corporations’ executives staff the boards of most of the major cultural and social institutions of the region. Their lawyers and lobbyists propose legislation to benefit their industries and companies. Locally the major corporations join together to form the Cincinnati Business Committee (CBC) and the Cincinnati Center City Development Corporation (3CDC) to promote their agenda of corporate rule and gentrification at the expense of local communities. Their corporate PACs and some of their stockholders contribute to the political campaigns for local, state and national office, to keep both major parties working for them. All of the reins of local power can be traced back to a hand full of people who live in Indian Hill or perhaps Hyde Park. When they look down through the windows of their gleaming corporate headquarters in Cincinnati, what do the CEO’s see—or perhaps we should say, what do they overlook? The official unemployment in Cincinnati stands at 8.5, but most authorities believe the official rate underestimates discouraged workers. African American and Latino unemployment is generally estimated at twice that of whites closer or percent, that is, 16 or 17 percent. For youth the unemployment rate is 40 or 50 percent. And many of us have part-time jobs, rather than the full- time job we need. We have in our city tens of thousands of people who cannot find work, many of whom have exhausted or are close to exhausting their unemployment payments. No wonder then that Cincinnati is once again on the list, as it always is, of the ten poorest cities in the United States. We are number eight this year. Median household income for whites in this city is $46,615, while for African Americans it is $22,216. The Federal government sets the poverty level for a family of four at $22,050, so we can say that our city’s black population lives, by and large, on the edge of poverty. And many have fallen over the edge into the pit of poverty. Hundreds in Cincinnati have lost their homes, thousands throughout the state. While the corporate CEO’s all enjoy excellent health insurance, Cincinnati has, according to the last count, almost a quarter of a million Cincinnati residents are without health insurance. Some 11 percent of Cincinnatians, or 234,000 people had no health insurance, according to the most recent study. Some health situations are critical. African Americans continue to have an infant mortality rate in Hamilton County of 18.7 per 1,000 births compared to 6.3 for whites. We are watching not only our city, but the entire region stagnate and decline. Today almost no one in our area can feel secure in their job. Meanwhile, the Republicans at the state level and the Democrats in the city, cater to the needs of the corporations while they ignore the needs of the citizens. Disgracefully rather than creating jobs, they attack the unions that offer some protection to working people. I be joining the Occupy Cincinnati protest on Saturday, October 8. I hope you will be there too. We have to take a stand. We know that today the banks and corporations dominate America. We know that corporate CEOs and financial insiders collude with the Republicans and Democrats to determine the national agenda. Together they make the rules—and they make the profit. We pay the price. It’s time to stop it. We need a new distribution of wealth in this country. We need to provide jobs for all. Good jobs at living wages. We need education and health care for all, and those should be free. And it can be done too. We need to start by ending the wars in Iraq and Afghanistan, by bringing all the troops home, and closing the hundreds of U.S. military bases around the world that do nothing to defend us and do a lot of harm to others. Most important: we have to change the system. The Declaration of the Occupation of New York City adopted on September 30 indicts Wall Street as responsible for the joblessness, homelessness, environmental destruction, and many others. The Declaration describes the damage done by the capitalist system: unemployment, foreclosure, and others. 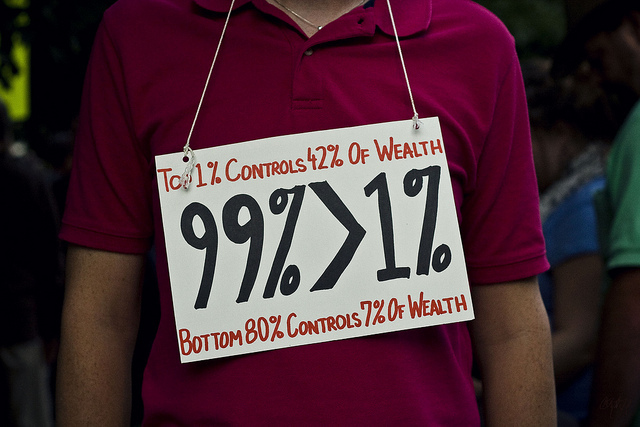 Wall Street represents the nerve center of the worldwide capitalist system. Profit and loss rule the world. The stock market, the banks, the corporations ruin the lives of people not only here, but around the world: from Africa and Asia, from Europe and Latin America. Cincinnati’s multinational corporations participate in this worldwide system that enriches some and impoverishes many. 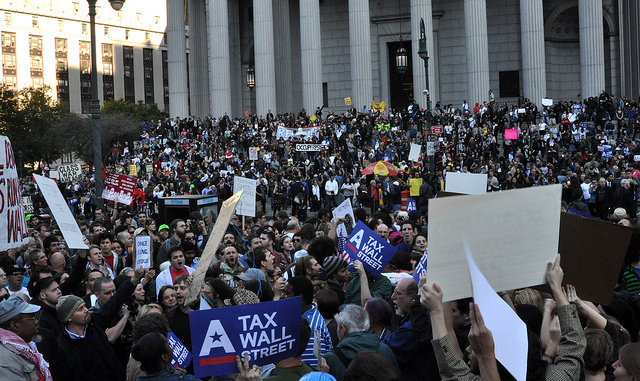 Right now, in New York, they’re symbolically striking at the system’s heart on Wall Street. Here in Cincinnati we’re protesting a regional center of this system. In the days that come, we need to go on to build a movement that can transform this system into one that is fairer, more just, more democratic, more egalitarian. Everyone in our country—and in the world for that matter—deserves a decent life and standing in the way of that possibility are the financial institutions clustered in Lower Manhattan. Standing in the way is Wall Street. Standing in the way are Cincinnati’s multinational corporations. We need to make our movement stronger. The strength of this movement is not just the individuals participating, but in our relations to our families and friends, to our communities and workplaces, to our unions, schools, and religious congregations. We need to bring these groups together to build a social force, and a political movement. Not their kind of politics, of course. Not Wall Street financing. Not Madison Avenue advertising. Not Democrats and Republicans. Our politics are the politics of people who recognize that something has to change. Our movement is made up of young people without jobs and who can’t afford school. Of working men and women who’ve lost their jobs. Of families who’ve lost their homes. Of African Americans and Latinos who never fully shared in opportunity. We are working together to build the power to create a new democratic system and bring justice to our society. How amazing and exciting that we will march here in Cincinnati, joining the protesters in New York, learning from the Egyptians in Tahrir Square, the indignados in the plazas of Spain, and the workers of Wisconsin. We’re part of a new, international movement for democracy and social justice around the world. We’re part of a movement that can change history, that change the direction the world’s headed. A movement that can save the planet and its people. I am in Portland OR and fight alongside you. Over 1000 cities across the world are also occupied. Sign up for our Solidarity Newsletter. Get articles and upcoming events delivered every month. Solidarity depends on the generous contributions of its friends and allies to continue its work. Free Julian Assange! No extradition to the U.S.! What is the Rank-and-File Strategy, and Why Does It Matter?